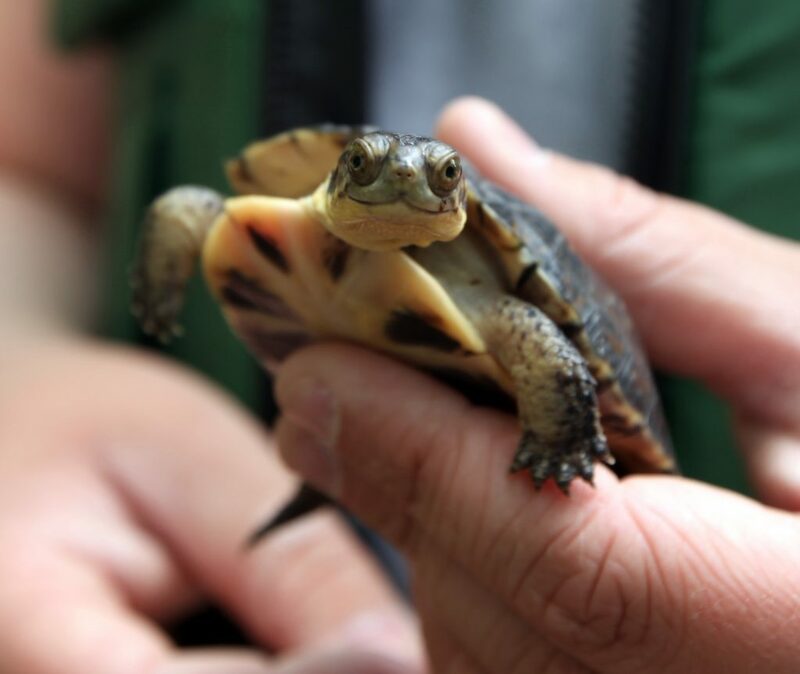 A photo of a Blanding Turtle, which is easily identified by the yellow throat and chin. Photo by Wikimedia. BELLEVILLE – Local Naturalist Cheryl Anderson from Picton stood in front of council to speak on behalf of the Blanding Turtles one more time Tuesday night. Anderson said she wanted to make the case against a wind farm proposal on behalf a threatened species unable to speak for itself. “For me, it was just important to say those things again,” she said. During a special committee of the whole meeting, Anderson stood in front of Prince Edward County council to voice her opinion on the wpd White Pines Wind Project  that was first introduced in 2010. “When you have an area like the south shore of Prince Edward County that is a mostly undeveloped area that has a lot of species that use it that are already specifically at risk, then it behooves us to take care of that,” said Anderson. She voiced three main concerns to why this project should not continue. But, her biggest concern focused around the responsibility to protect the endangered turtles. The White Pines Wind Project was implemented as an alternative electricity source in South Marysburgh and a small portion of Athol, Prince Edward County. The project will consist of a large amount of construction in the area, which will ultimately disrupt and potentially remove the habitat of local species, she said. Additionally, the turtles will be put at further risk due to increased traffic especially during nesting season, she added. Currently, there is a plan in place stating that construction will not take place during the migration times, however Anderson is worried that due to unpredictable weather it is impossible to predict the exact dates turtles will be travelling. Kevin Surette, a representative for wpd Canada, said an Environmental Review Tribunal issued its decision on April 26, 2017, reducing the project to nine turbines from the 29 that was originally proposed. This decision was made after a long legal battle that started in 2013 with regards to the turtles safety and well being. The project is in full swing, after severn years of planning and Anderson said that there is a very slight chance her presentation to council will make a difference. “The municipality doesn’t really have any power in this. The power rests totally with the provincial government,’ she said due to The Green Energy Act  that was introduced in 2009. In the future, Anderson is trying to put together an annual south shore conference that will include several outside and local parties that will work towards getting legal protection from Prince Edward point to St. Peters point.